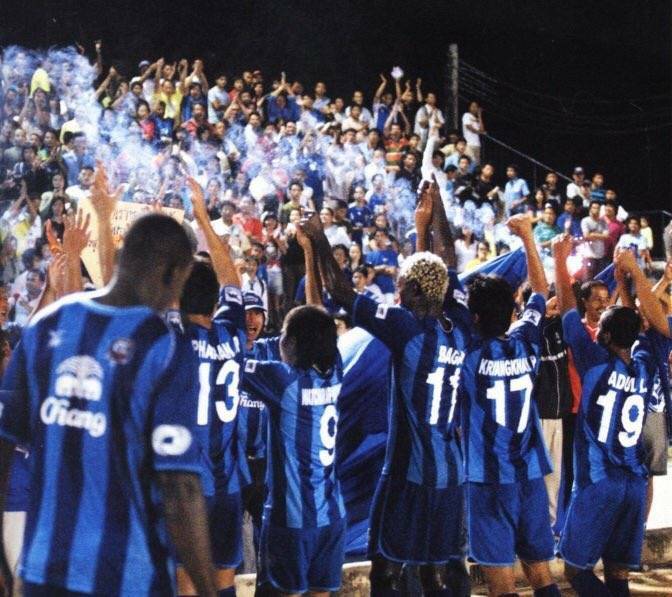 Chonburi FC is one of Thailand’s most recognizable clubs, and their success arguably paved the way for the creation of the modern Thai League. 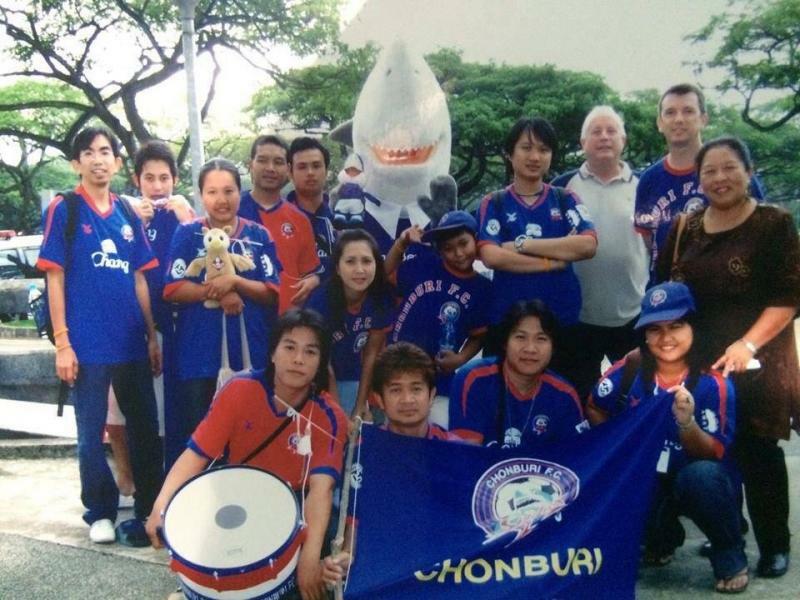 Today, Dale Farrington, a long time Sharks supporter, and creator of an independent Chonburi FC fan site, discusses the evolution of his team and the league over the course of his nearly 2 decades long stint supporting the club. Could you please walk us through how you discovered Chonburi FC, and what the state of the club was like at the time? Well, I discovered them is because I used to buy a local Thai football magazine, back when I was playing in the early 2000s, which had all the clubs listed in the back. It was when I was looking through one of these magazines that I realized there was a local team playing in the league, and that was Chonburi. So I set out one Saturday to find them, and I ended up riding all around the city. There was one ground that I suspected was the ground that they used, as it was the only one I had seen there. So I went there first, but it turned out that it wasn’t that one. So I rode all around the city, I was asking people where it was - nobody knew, nobody had a clue and they were all sending me off in different directions. And then eventually, just by chance, I stumbled upon the seaside stadium as it's known, which is the municipal stadium. As for the state of the club, it was obviously in its infancy. There wasn’t much structure there - to be honest, it was just like watching a local pub team in England. The players would turn up ten minutes before kickoff in their kit on their motorbikes, the game would start, they’d play, and then disappear at the end. There wasn’t much organization there at all. What initially fuelled your loyal and continued support for this club? At the time obviously, it was my local side. All my life I had gone watching football, so that was the one thing that I wanted to carry on when I came to Thailand in 1997. And back then, the league was nothing like it is now. All the teams were based in Bangkok, and they were all associated to companies, or the armed forces or the police force. When I actually found a local side, that were playing in a structured and organized league from teams all over the country, it was great. I had found what I was looking for, and I just started going along. For the first couple of seasons, it was difficult because it was so hard to get information. I mean people complain now - I don’t think I ever saw a league table! In 2005, when we won the league, things got more professional and there was more information. So it moved on from there, and then they restructured in 2006 when we went up to the Premier League. Where did you get the inspiration to start your website? At that time, there was one Thai football website, which was mainly about the national team, but they would have features on the league and the clubs. And it would have a message board. I got an email - somehow, I don’t know how - from someone from England that there was a couple of people chatting on the message board. So it started with a few of us just chatting about Thai football in English on this message board. I think the lack of information spurred us all on...people would ask me about new signings, or their next fixture, and I would share all this information. I was also quite friendly with the lad who did the programmes at Chonburi, and he asked me if I wanted to write some articles for the programme in English, and I was happy to. So I used to send him these articles, which sometimes they’d use and sometimes they didn’t, but I built a collection of articles. Then one of the lads on the message board made a website for Korat, and I looked at that thought it was brilliant. So he gave me some information and I decided ‘right, that’s what I’ll do.’ So I started my own website then, this would in August 2009. So if people are now asking for information I could just redirect them to the website. Plus, I had all of these articles with no place to put them. And that was really how it started. How did you go from that - having such a small club with few fans - to having ESPN interested in the club? How did that transformation happen so quickly? I think it all comes down to success really. No matter what people say, if your club is successful, people are going to want to come and watch. 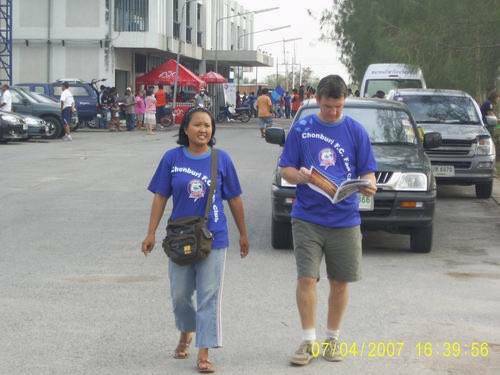 And because we were different - the only other provincial club in the top division at the time was Suphanburi and they weren’t doing very well - we were seen as the challenge to the old order, so we used to get fans from all over. You’d go for an away game in Bangkok, and they’d be a lot of locals supporting us because they felt like they couldn’t support the telephone organization or the port authority or the air force, or the police. We were the only club, and because we were doing well, it was easy for them to latch on to it. So that’s really how the fan base grew. Given the amount of time you have spent involved with the league, you have clearly seen an evolution in Thai football media, both on the Thai language side and English language side. What do you make of this evolution? At first, there was very little. The Thai sports press had results and there were a couple of magazines that came out that used to publish the scores and the fixtures. But there was very little online. Around 2009, all of us used to chat on [the English] message board and we all decided that it was time for us to work on websites. So suddenly you had about five or six dedicated club websites in English, and there was no other information out there in English, so we were the ones providing it. 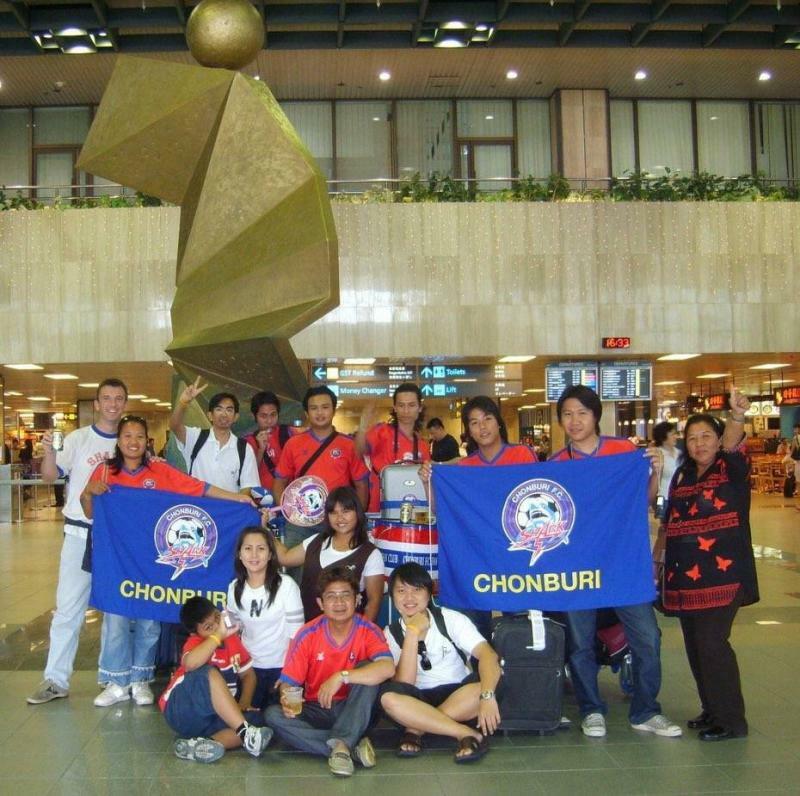 This was at a time when more and more people, not just foreigners but Thais as well, were getting more interested in Thai football - partly because of what Chonburi had done. This kind of gets overlooked as people who have only started watching in the past few years don’t realize the part that we played in what we have now. 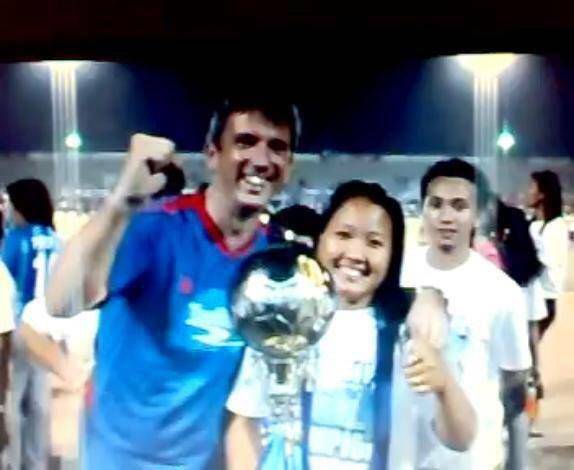 I mean, if it hadn’t been for us and our success, I guess someone would have come along and done it, but we completely changed the face of Thai domestic football. Without a doubt. That’s not my opinion, that's a fact. The fact that we were a provincial side, we were successful, we had an organic fanbase. 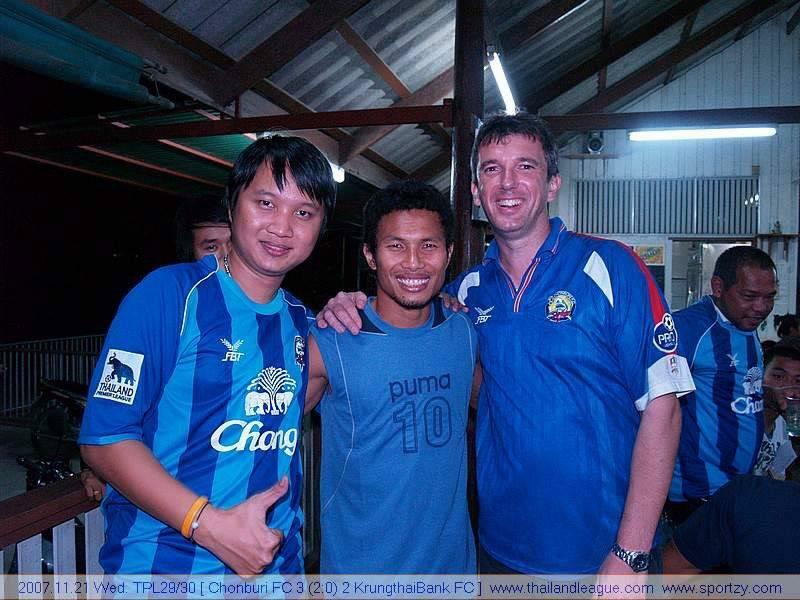 Can you name some of your favorite Chonburi players over the years? What made these players stand out in particular? Pipob On-Mo, obviously. Just brilliant, absolutely. For me he kinda epitomizes the whole club and the spirit of the club. I was so pleased with his testimonial. I have never cried at a football game but his testimonial was genuinely moving. It was no nice that the club did it, and they did it so well. They got everything absolutely spot on. The crowds came, and you could tell he was moved. It was just beautiful, and he deserved it. A few more from that era. People like Adul, great player...why did we let him go? Twice! He was a great player, someone who would run through brick walls for you, very loyal and a good footballer as well. Therdsak Chaiman [was also] brilliant. He could still play now, I am convinced, and this is not me romanticizing things. He was brilliant. On some of those AFC nights, he was head and shoulders above everyone else on that pitch. Even though we got him towards the end of his career he was an absolute joy to watch. Again from that championship team, I’d have to say Kosin [Sinthaweechai Hathairattanakool], who grew up with the club and experienced all that success. Thiago [Cunha], with all his faults, was brilliant. You look at his record at Chonburi and it’s phenomenal. A lot has been said about the change in quality of Thai football over time. In your opinion, is Thai football currently the best it has ever been? If not, when was it at its best? I don’t think it is currently. What has happened is that people’s expectations have changed. When we used to go watch the games, even in the Premier League for the first couple of years, you knew the quality wasn’t great, but it was a day out with a really nice atmosphere and it was something you enjoyed watching. But, when things changed in 2009, and when things off the field got more professional and more polished, and you had new grounds, with team replicas coming out, the coverage improving and all the rest of it, then people’s expectations were raised. Because you had to buy a ticket for 150 baht, you were sitting in your seat in a stadium, you could buy a hat or a t-shirt...and it did get a lot of new fans at the time. So people coming in then were sold this as a professional league. But, on the pitch, things didn’t really get better. But people’s expectations were raised because of what was happening around the league. So you were still watching the same thing you were watching a few years earlier, but you were then surrounded with a much more professional setup. And that boom, there was no way they could sustain it because I think people kind of saw through it. We’re being told its a professional game, its a top league, but the quality really isn’t that great on the pitch. And I think that’s why the crowds are dropping off because people can see through that. Overall the standard has improved, but again I don’t think it’s as good as it should be. What about your club Chonburi specifically? They have been on a slow decline for the last few years; what does the future hold in store for them? Again, I don’t really know to be honest. They’re putting in a lot of hope in this academy, but from what I’ve seen and what I’ve heard it’s not the answer to our problems at all. I really don’t know what to expect. But in terms of what I’d want, I’d be happy with just seeing some entertaining football, players who want to play for the club, maybe a couple of good cup runs like we had last season, and a top half finish in the league. I think that is all we can expect now. The days of challenging for the top honors have done. And unless we get massive investment...the people who run the club will not want to give over control, but unless they do, and bring in someone with a bit more nous and is a bit more tuned into what’s needed to turn things around, then nothing will change. One of the things that I’m quite proud of at our club is also one thing that also frustrates me. It’s the fact that, with one or two exceptions, we are very loyal. The coach we’ve got now played for the club, he’s been part of the backroom staff for the past 12-14 years, and now he’s the head coach. That’s a commendable thing, it’s like the Liverpool boot room approach. So they’ve got this core of people who are very loyal, and the loyalty goes both ways. But it’s also frustrating because sometimes it can also be a hindrance. Without that, without them, you wouldn’t have a club. But at some point, something has to change. Because I don’t think they know what they’re doing in this current climate. They need someone who is going to come in, and shake things up, and put them on the right track. Lastly, you have spent the last few months working on a book about Thai football. Please tell us a little bit about that project, and what your motivations were in undertaking it. Well, nowadays you’ve got all of these people writing about Thai football. You’ve got all these websites, you’ve got Twitter, you’ve got Facebook, you’ve got independent bloggers - if you scour the internet now you can find hundreds and hundreds of articles of people watching Thai football matches. I just thought it would be nice to have a collection of stories about people’s experiences watching Thai football. Everybody has come into it at a different time, people have seen it at different stages of its development and people have different experiences. I just thought it would be nice to have a collection of stories from over the years about people’s experiences. Football books are quite a big business nowadays. Anthony (Sutton) was an inspiration for it, his stories and his travels around South-East Asia. The state of it at the moment, the editing process is quite drawn out and laborious. We’ve got people whose first language isn’t English. But what I’m trying to do is keep the essence of what they’ve said, so not to change it too much. I’ve got some really long, 5,000 word contributions from some people which just take very long to edit. I’m trying to look for some themes as well, so I can kind of link them, even if it is a collection of unrelated stories. I’m trying to look for something that’s going to be running throughout the book. I’ve approached a publisher and they’re keen, and I’m on holiday now so I hope I can get a couple of draft chapters out to them just to see if it's the kind of thing that they’re looking for. All the stuff I’ve got is really good, it’s been really great reading through it and it’s kind of exactly what I was looking for. 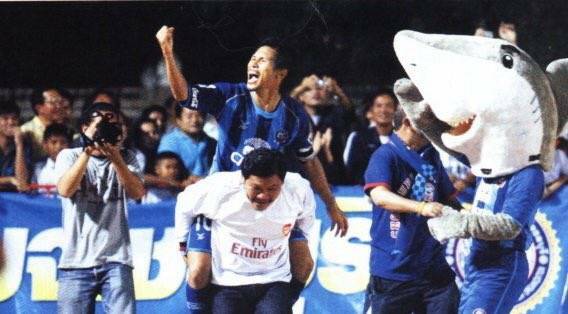 It captured the essence of what watching Thai football is all about and people have been very honest.